Imagination. Bipartisanship. Bureaucratic Competence. Yes, My Children, We Once Lived in Such a Place. David L. O'Connor received his Ph.D. in history in 2000 from Stony Brook University, and is a history teacher at Paul D. Schreiber High School in Port Washington, NY. Benn Steil is the Director of International Economics at the Council on Foreign Relations. He is the author of The Battle of Bretton Woods: John Maynard Keynes, Harry Dexter White, and the Making of a New World Order, which won the 2013 Spears Book Award in Financial History. His latest book, The Marshall Plan: Dawn of the Cold War, examines the planning, implementation, and impact of what is often considered the most effective foreign aid program in American history. David L. O’Connor:Your new book examines the origins, objectives, and impact of the famous American aid program within the overall context of the Cold War and the Truman administration’s policy of containment. What do you consider the most important factors that led to the United States’s abandonment of its long-standing policy of keeping clear of European affairs? “My convictions regarding international cooperation and collective security for peace,” wrote one-time isolationist Republican Senator Arthur Vandenberg, one of the heroes of my tale, “took firm form on the afternoon of the Pearl Harbor attack. That day ended isolationism for any realist.” It had been FDR’s determination to cooperate with the Soviet Union in pacifying and stabilizing Europe after the war, but by spring of ’47 it was clear to Truman and Marshall that the United States would have to act unilaterally to prevent western Europe from sinking into economic chaos and turning to authoritarianism. “I don’t care whether entangling alliances have been considered worse than original sin since George Washington,” was the reaction of the State Department’s John Hickerson after Truman ratified the NATO treaty in 1949. Technology and commerce had made the world a much smaller place; the economic and physical security of the United States now depended on it having strong, independent allies abroad. One of the most dramatic changes of American policy in light of the Soviet threat concerned the role of Germany in post-war Europe. FDR’s wartime Morgenthau Plan envisioned a Germany with a greatly diminished industrial base, but soon after the war ended, American policymakers saw German economic recovery as essential to the stability of Europe as a whole. What accounted for such a stark shift in American thinking? By 1947 the State and War departments had concluded that the Morgenthau Plan was a moral and geostrategic disaster. Maintaining order and preventing starvation in western Germany was straining the U.S. military and Treasury. They also realized that the only way to revive western Europe quickly was to get German mines and factories back up and running at full capacity. No one knew, of course, whether western Germany could be transformed into a peaceable democratic ally, but there seemed no acceptable alternative to trying. The most likely alternative seemed to be a Communist western Europe. The Truman Doctrine was an early pronouncement of American anti-communist policy, promising military aid to countries facing a threat from the Soviet Union. Within a few months, that was seen as insufficient to meeting the Soviet challenge. Why did Truman’s national security team want to also use economic assistance to combat the Soviets? People forget what Truman actually said in his speech, which is that “I believe that our help should be primarily through economic and financial aid which is essential to economic stability and orderly political processes.” The State and War departments had already concluded that relying on the military to stabilize Europe was politically impossible: the public wanted the 3 million troops out immediately after the fighting ceased in 1945. The Marshall Plan was the first, and greatest, offshoot of the Truman Doctrine, designed to leverage America’s economic dominance to help western Europe revive and defend itself. Why did Secretary of State George Marshall choose to announce the European Recovery Program at Harvard’s commencement? How was the speech received by those in attendance and in the American and European press? Marshall directed George Kennan to formulate the outlines of the plan in May, following his return from six weeks of fruitless negotiations with Molotov and Stalin in Moscow. He had turned down invitations from Harvard the past two years; now seemed the right time and venue to make the basic ideas public. The speech was short and vague for two reasons: Marshall wanted the Europeans to take ownership of the plan, and he did not want the United States to be blamed for splitting Europe by excluding anyone—specifically, of course, the Soviets. Marshall being a dry speaker, the Harvard audience had little sense that the speech was important. The next day’s newspaper coverage was as bland as Marshall’s delivery. His deputy, Dean Acheson, however, had briefed British newsmen in advance, insisting that the initiative was historic. “Wake Ernie up,” he told one of them—referring to Foreign Secretary Ernest Bevin. Bevin and his French counterpart, George Bidault, immediately began galvanizing Europe and sculpting its response. In today’s toxic political environment, it is deeply refreshing to read about American legislators and executive branch leaders putting aside their partisan differences and working together to craft and pass a successful foreign policy initiative. You contend that Senator Arthur Vandenberg (R—MI) deserves a great deal of credit for convincing a somewhat reluctant Republican congress to appropriate significant sums of money to rebuild European nations just as we confronted our own post-war economic troubles. What personal and professional attributes did Vandenberg possess that made him so effective? Vandenberg, as a former isolationist, had the zeal of a convert. He also believed that foreign policy had to be bipartisan, and that it was the mutual responsibility of the president and the chairman of the Senate Foreign Relations Committee to get on the same page—irrespective of their party affiliations. Vandenberg gave Truman a tongue-lashing after Acheson presaged Marshall’s scheme in a May 1947 speech. “Harry,” he said, “I want you to understand from now on that I’m not going to help you with crash landings unless I’m in on the takeoff.” Thereafter, Marshall secretly consulted with Vandenberg regularly, and deferred to him on legislative strategy—even where he was not wholly at ease with the senator’s approach (particular his anti-communist framing of the aid scheme). Vandenberg was a master legislative tactician, as skilled as any committee chairman ever was in eliciting the testimony his skeptical colleagues needed to hear from witnesses. Another key Republican in this effort was President Herbert Hoover, who enjoyed a warm and productive relationship with Truman. How did Hoover contribute to this shift in American foreign policy? Hoover was particularly important in explaining the vital economic and political necessity of reversing occupation policy in Germany. The United States, he argued, could “keep Germany in these economic chains, but it will also keep Europe in rags.” West Germany would become the fulcrum of the Marshall Plan—the industrial engine of a new, integrated western Europe. Many Americans may be surprised to learn that the U.S. actually offered the Soviet Union and its Eastern European satellites Marshall Plan aid when the ERP was first unveiled. Why did the Truman administration make the offer and how effectively did that serve our post-war anti-communist efforts? The offer to the Soviets was disingenuous. The State Department was prepared to continually reframe the invitation as necessary to ensure that Stalin eventually rejected it—and therefore bore the blame for splitting Europe. And he did reject it, and demanded that the Soviet satellite governments reject it, once he saw that the Marshall Plan threatened his economic and political control of his country’s new, hard-won security buffer. This helped the United States show the world that the Soviets sought dominance rather than recovery. How did the passage and implementation of the Marshall Plan contribute to increased tensions between the U.S. and USSR? 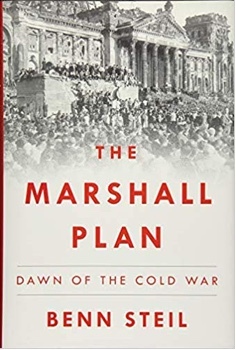 I argue in the book that the Marshall Plan marks the true beginning of the Cold War, because it was not until Marshall’s speech that both the United States and the Soviet Union abandoned the Yalta-Potsdam framework for postwar cooperation. Stalin begins his political crackdown on the coalition governments in the east after the speech, instigating a Communist coup in Czechoslovakia to push out the democrats in February 1948. This galvanizes Republican support for the plan in Congress, helping to pass the legislation in April. This, in turn, heightens the U.S.-Soviet conflict over Germany. Coming back to Germany, how did Stalin attempt to disrupt American and British efforts to revive the western occupation zones in Germany? How did his actions contribute to a strong backlash and ultimately fail? Stalin, seeing the American plan for a reindustrialized, democratic capitalist western Germany as a major security threat, begins his blockade of Berlin after passage of the Marshall aid legislation. It is commonly believed that Stalin launched the blockade to force the western Allies out of Berlin, but that was in fact a secondary aim. He made clear in negotiations that he was willing to lift the blockade if the Americans would cease plans for creating a sovereign West Germany—which they refused to do. The Allies defeated the blockade not merely with a heroic airlift, but with a counter-blockade that hit the eastern German and Soviet economies far harder than Stalin had anticipated. The ending of the blockade and the creation of the Federal Republic of Germany came almost simultaneously in May 1949, underscoring the extent of the Western victory. One of my favorite parts of the book is your analysis of the tactical flexibility the U.S. showed in implementing the ERP in countries with very different political cultures. Can you give us some examples to illustrate the dexterity in American diplomacy? The French were appalled by the Truman administration’s vision of a revived western Germany, which they had wanted to plunder and pastoralize. The British resented being treated as a bankrupt part of a U.S.-architected western Europe, rather than as a great imperial power. The State Department neutralized the French by, brilliantly, legally classifying Marshall aid to Germany as loans, and insisting that no one would extract a further pfennig from Germany until Washington got paid back (which it knew it never would). This stick made the French more dependent on the carrot of Marshall aid, which they could only access after agreeing to integrate their economy with Germany’s and western Europe’s. The most critical concession the U.S. made to both France and Britain was agreeing to supplement Marshall aid with security guarantees—NATO. Why did you devote so much attention to the writings of journalists Walter Lippman and James Reston? Do you think there are any journalists today whose work will command so much attention from future historians? That is an excellent question. The Administration (Kennan in particular) was extremely sensitive to criticism from Lippmann, whose views commanded great public regard. The closest analogy today would perhaps be Bob Woodward, whose books focus on personalities and decision-making processes. They don’t examine actual policy with nearly as much depth. Perhaps the most important point you make in the book is that the Marshall Plan was a success. In what ways did the plan fulfill its economic and strategic objectives? Western European output increased dramatically during the Marshall years—although I explain in the book that a recovery of sorts was, weather setbacks notwithstanding, already in train by 1948. This makes it difficult to isolate the impact of Marshall aid. The broad ongoing American commitment to West European recovery and security, however, was essential to keeping the French and Italian Communists out of power, and the reversal of the Morgenthau Plan was essential to galvanizing German industrial might to revive, rebalance, and reintegrate the economies of its western neighbors. In what ways would you say that the Plan came up short? Despite the fact that the Marshall Plan was meant to protect vital U.S. economic and security interests in western Europe without relying on the military, it would never have succeeded without security guarantees—through NATO. You note that there have been calls for new “Marshall Plans” to accomplish everything from rebuilding war-torn countries, to alleviating poverty in developing regions around the world, to protecting the environment. Why has success in replicating the Marshall Plan been so difficult in different parts of the world? The United States has spent about $210 billion on reconstruction aid alone in Iraq and Afghanistan, which is more than 50% greater than the totality of Marshall aid in current dollars—yet we have virtually nothing to show for it. There are many differences in the circumstances then and now, but two bear particular notice. The first is the presence of a capable, largely apolitical bureaucratic infrastructure, willing and able to carry out coherent reconstruction and reform programs, in the Marshall countries. The second, more important, is the presence of far greater internal and external security in the Marshall countries. Critical external security guarantees came from the United States, in the form of NATO, in 1949. In fact, NATO became known in the State Department as a “military ERP,” or European Recovery Program—the official name of the Marshall Plan. In contrast, the Afghan and Iraqi governments have faced vastly less favorable circumstances than those of the Marshall countries. They never achieved full control of their territory. Instead, they have been under constant siege from armed domestic and foreign opponents, such as the Taliban and ISIS. Their governments were not, unlike Marshall governments, natural allies of the United States, which has in turn been at odds with alternative neighboring benefactors such as Iran. In short, the foundation that enabled American economic statecraft to be so successful in postwar Europe is lacking in the cases of Iraq and Afghanistan. Given the insatiable desire to create new Marshall Plans around the globe, it is important to recognize that physical security is prerequisite for economic security. Today, Vladimir Putin is pursuing Stalin’s post-war objectives of undermining the relationship between the U.S. and Europe, and sowing discord among European states. What can current American and European leaders learn from the West’s response to Stalin’s machinations as they confront Putin? We must be firm in defending our vital political interests, as we were in the late 1940s, but we must also be hard-headed and realistic in defining those interests. We remember the Marshall Plan today because it was visionary. But it was also hard-headed, and it was successful because it was hard-headed. If we had defined success to include bringing Czechoslovakia and Poland into the Marshall Plan, for example, the plan would today be seen as a failure. That is because a fundamental aim of the plan was to defend vital American interests in Europe without relying on military force, and we would have had to go to war with the Soviets to pry Czechoslovakia and Poland from the Soviet bloc. As I argue in the book, we have not been nearly so hard-headed since the end of the Cold War in our expansion of NATO to Russia’s borders. Expansion has been grossly underfunded—given the seriousness with which Russia views the threat to its interests. We need to limit our aspirations or make the financial and military commitment to realize them.